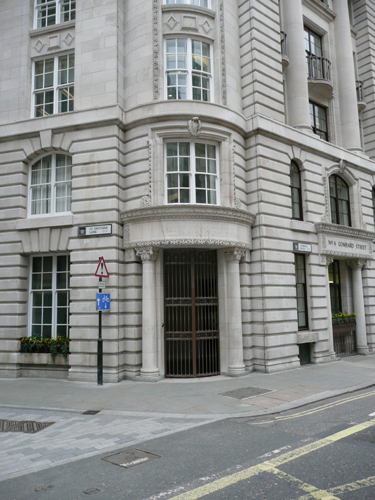 The Scottish Provident Building, 1-6 Lombard Street, in London, was designed by the architect William Curtis Green in 1912. 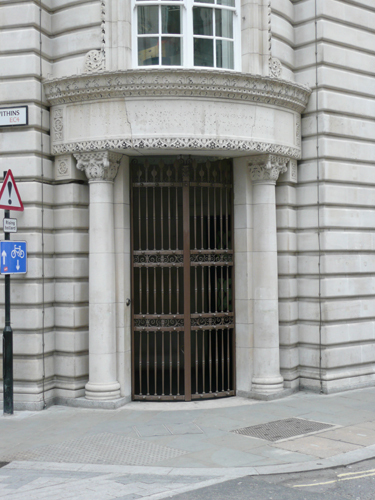 I was asked to examine the curved gates on the corner of Lombard Street and St Swithin’s Lane. The aim was to establish the original paint colour. Some thirteen samples of paint were taken from representative surfaces. It was found that the gates had been stripped of most of their earlier layers of paint, but a close examination revealed that some areas displayed a thick build-up of paint. 4) A dark green top coat containing Prussian blue, lamp black and chrome yellow. This was a colour that would have been called Dark Brunswick Green – one that saw a lot of use on ironwork at the time. An essay on the use of colour on external ironwork can be found here. 1 I have found that an average of seven years is more usual.